Volume 2 continues our “six-pack” series with the below topics on the Godhead and the Word of God. Denise narrates topical scriptures backed by meditative music created and performed by Mark taking you into a soothing atmosphere of God’s presence. Each CD has a different topic, with different instrumental pieces, so no two are alike! Get lost in God’s love. Note: Mix liberally with faith for best results. No harmful side effects associated with our six-packs! BONUS: Viewable & printable scripture text files on each CD. 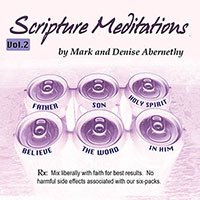 Volume 1 is a powerful “six-pack” containing the below listed topics read by Denise blended with Mark’s original anointed instrumental music on six CD’s. The healing CD contains every instance of Jesus’ healings in chronological order. ** The Healing CD may be ordered separately. This popular CD single, Abundance, includes scriptures about wealth, gain, prosperity, giving, increase, sowing, reaping, wealth, inheritance, and the richness of God’s abundance towards us. 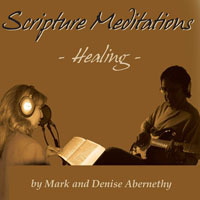 There is approximately one hour of scripture narration by Denise spaced with enough of Mark's anointed instrumental music to give you time to think about each passage before you hear the next one -- thus the name Scripture Meditations. Be blessed as you saturate yourself in God’s Word. BONUS: Viewable & printable scripture text files on CD. 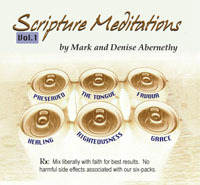 This often requested CD is taken from our Scripture Meditations, Volume 1. It contains selected healing scriptures which include every instance of Jesus’ healings in chronological order. Mark’s anointed instrumental music is a soothing backdrop to Denise’s narration of the scriptures. Great for meditating on the word. We’ve already received a lot of testimonies from people who have received their healing while listening to this CD! The Word of God is powerful and brings results! BONUS: Printable and viewable scripture text files on CD. 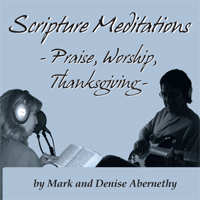 Like our other Scripture Meditations, this newest 70-minute CD contains narrated scriptures by Denise on praise, worship and thanksgiving with Mark’s original soothing musical accompaniment. You’ll be ushered into the presence of God as you allow your imagination to take hold of these verses and transport you thru time.